This site provides some background and context to the author's activities, interests and projects. 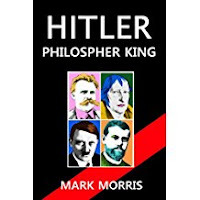 Hitler and the NSDAP are a social and historical phenomenon, and this forthcoming book proposes that Aspergic personality and postmodern philosophy combined to enable both his personal political success and then the nature of the regime that he constructed. Hitler himself was clearly not a normal human being; genius and exceptional in some areas, he could single-mindedly pursue personal and political power. Nietzsche’s crystallization of the previous century and a half of German idealism in a rigorous moral and cultural nihilism, was reified and rolled out with Weberian bureaucratic and Prussian militaristic efficiency. The post modern state created did not rest on history, religious or cultural traditions. Ideology was shaped instrumentally in order to yield the maximal amount of the only currency that survives the caustic deconstructionism of postmodernism, namely power itself. To celebrate the launch (finally) of this book, which is up on all the main e-book platforms; for a limited period, anyone contacting me by email to request a copy will be sent a free copy as an e-pub or PDF file. HistoryPhilosophyLeadershipAsperger'sPostmodernismPsychology/psychiatryPowerIf you've bought it already, contact me with proof of purchase and I'll send a paper copy at cost.